Jewish women have been on the protest front lines throughout history, championing causes from civil rights and gay tolerance to public health care and anti-violence policies. Given the massive focus over the past year on the Occupy movement to protest Wall Street corruption, we thought we’d devote this issue to spotlighting Jewish women who find unique ways to speak out—flash mobs … photo campaigns … creating a new sorority. We hope the creative ideas for demanding change will get you thinking about how you might make your own voice heard. Israeli women in the ultra-Orthodox public sphere demand to be seen and heard. A college student fights exclusion by creating a sorority that honors differences. Why one woman says she’s disturbed by the lack of involvement from other Jews in the Occupy movement. Frances Goldin, 87-year-old Occupy protester and long-term activist, tried her hardest to get busted. An organized group of Israeli women protest Jewish Law with a photo campaign of women praying with the Torah. 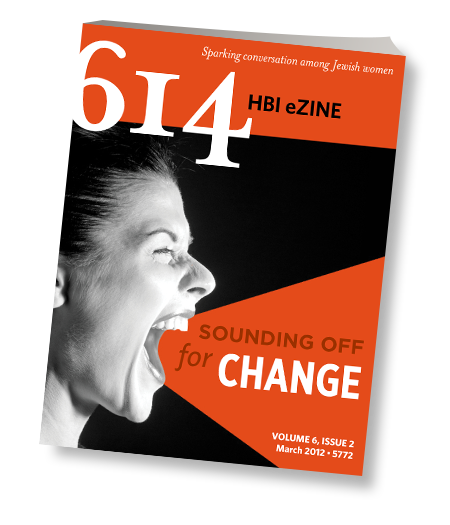 A sampling of resources on Jewish activism.